Welcome! While you are here check out our Sacred Geometry Forum.Connect your dot to all the other singularities and co-create a whole that is greater than the sum of its parts! And don’t miss our truly awesome new Sacred Geometry Shop! 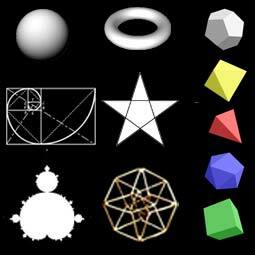 Everything has a Geometric aspect to it. For a phenomenon to manifest, or a thing to exist, it cannot be 100% random and chaotic. There must be a substructure, a constellation of patterns that connect it to other patterns and allow energy to flow through it as it follows the natural path of least resistance through spacetime. Everything has a Sacred aspect to it. For a thing to exist it cannot be completely separated from the Whole of Existence and its Source. There is always a way in which every thing is related to Everything, and through that relationship it strengthens our relationship to the Source of all patterns and all Meaning. As with Music, the more you know about Sacred Geometry the more clear it becomes that the apparent endless complexity of everything is always based on the same simple fundamental forms and principles. If you become familiar with circle designs such as the Flower of Life and Metatron’s Cube, the behavior of Spheres, the Torus (smokering/magneticfield shape), the 5 Platonic Solids, the Vector Equilibrium, the Golden Mean, Fractals, Higher Dimensional forms, and the ways they relate to each other – then you have the foundation upon which pretty much everything else is created. These patterns can rightly be called ‘sacred’ because they are the first building blocks of form to arise from the formless. At least as far back as Pythagoras and Plato it was believed that the study of the fundamental forms awakened higher faculties of the human mind and spirit. In a time of global technological crisis such as this, when the transformation of society is so urgently needed, Sacred Geometry is an important tool to accelerate human evolution individually and collectively. There is no limit to the insights that can be obtained through the communion with these divine archetypes that are the building blocks of creation! 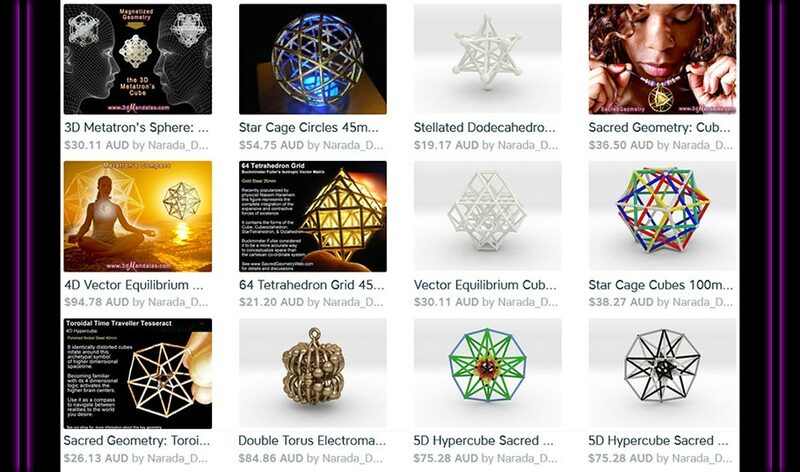 We are excited to share with you our affordable range of printed Sacred Geometry models in a variety of materials and sizes, from wearable gold plated jewelery to large altar pieces and teaching models. 3D Printing is the next technological revolution set to change the world as much as the personal computer and the internet have done. 3D Printed Gold Enrobed Jewellery. Hold the future in your hands today! These forms are powerful pixel perfect manifestations of the primal patterns of Existence. Pendants, Altar Pieces, 3D Meditation Mandalas, Teaching Aids, and Objects d’Art. Most people would have trouble giving an accurate explanation of what a ‘dimension’ is, especially as the word has been used in pseudo-scientific and new-age jargon to mean a parallel reality or astral world of some kind. The idea of 3 spacial dimensions is taken for granted without detailed examination as to what it really means. Therefore it is not unexpected that people might go a bit cross-eyed if you start talking about 4 dimensional forms such as the hypercube. Many people know that Time can be considered to be a dimension. But what could possibly be meant by a fourth spacial dimension? Although it is a concept that has been particularly influential in the last century and a half among mathematicians, scientists, and perhaps occasionally artists and mystics, it is indeed not the easiest thing to understand! Yet there is no obvious reason why existence should have only 3 spacial dimensions and not 4 or more. In fact our computers deal with space of any number of dimensions without bias. They can even calculate for us what the 3 dimensional shadows of objects rotating in higher dimensional space would look like. See the rotating 4 dimensional ‘hyper-cube’ on the left for example. Recent mainstream physics Holographic theories hypothesize that all the information of Everything can be contained on the 2 dimensional boundary of the universe and that the 3D universe is only mental projection of it that we create for our convenience. Personally I think that existence is more likely multi-dimensional, and casting lower dimensional shadows, than the other way round ! Okay so enough musings about incomprehensibles – I hope I have not scared you away by throwing you into the deep end of the dimensional pool 🙂 Sacred Geometry Web will feature many musings about dimensions as they are a key to understanding the symmetries of spacetime. My name is Narada Dan Vantari. I am the creator of this site and its Forum, and also www.aNewScienceOfEverything.com where you will find all sorts of interesting materials about the revolution happening in every field of human knowledge from physics to economics, history to cosmology, and more. I have a central hub for my creations at www.NaradaDesign.com, and my oldest website is www.BirdTribes.com inspired by the book ‘Return of the Bird Tribes’ by Ken Carey. 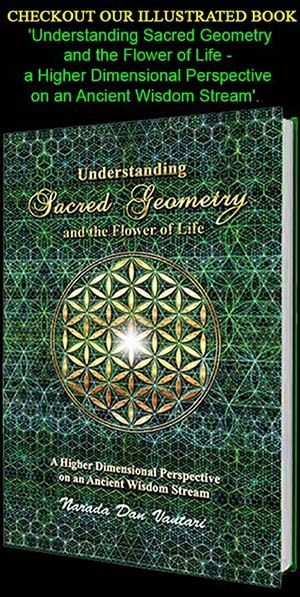 I am also author of the book ‘Understanding Sacred Geometry and the Flower of Life – a Higher DImensional Perspective on an Ancient Wisdom Stream’ which is available here. I am privileged to be friends with many well known Sacred Geometers including Robert Lawlor, Dan Winter, Nassim Haramein, Jonathan Quintin, Marshall Lefferts, Foster Gamble, Jain the Mathemagician, and Grayham Forscutt, all of whom have inspired me on my own Sacred Geometry path, which has developed from a more artistic and mystical rather than scientific or technological perspective. It is perhaps more important in the 21st century than ever before, that we do not waste our time and energy on frivolous pursuits or entertaining distractions. As I see it, the only possible solution to the worlds multitudinous crises is that the human heart and mind and spirit, rapidly awaken from the nightmare we call our history. I believe Sacred Geometry can be a key to accelerating this process on a global level, a pathway for developing science and technology in harmony with nature, an inspiration for uplifting artworks, and a universally acceptable symbolic spiritual language for the world’s multifarious religions. I am heartened by the knowledge that there are multiple sacred geometry related projects evolving that will bring new technologies and insights of a world changing nature! Click here to visit the Forum and join the discussions.